What is Red Tag (Sealed) Sample? A sample with red tag is an identification of a sample that buyer had approved and sealed that particular sample for production. A sealed sample means approved garment construction, approved trims attached to the garment. Receiving a Red tag sample from buyer is the approval for production go ahead to the factory. 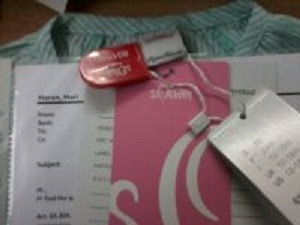 Buyers attach colored tags to approved samples and send back to the suppliers. Buyer uses different color tags for different sample type, like Green tag is used for Size set samples and Red Tag is used for PP samples (Pre-Production sample). Once attached these tags can not be removed easily from the sample garment. Tag is attached to a sample (some buyers also include comment sheets) so that suppliers can not replace sealed sample or can not show any other garments as a approved sample. Tags are attached to sample to ensure that no unapproved sample is referred in production. Secondly a Red Tag as shown in the above image helps merchandisers, production team and quality personnel to identify easily the correct sealed sample for production from other samples of the same style . If there is any confusion related to garment construction at time of production, production department just refers to the Red tag sealed sample. At the time of quality inspection buyer representative refers to the sealed sample and buyers comments on that sample. Shipment inspection is done based on the sealed sample. Note: Color coding for the tags may vary buyer to buyer. Online Clothing Study: What is Red Tag (Sealed) Sample? what does a red tag sample mean. why different colored tags are used in sample.